" I'd say don't try to sit down and watch it uninterrupted. If it's on the Sy Fy Channel then invite your friends over, bust out the pizza and board games, and leave it on in the background for periodic ridicule. " Tagline: No one knows how to stop it ... but one woman knows how to control it. While on an archeological search in Libya, Griffin from Party of Five and his no-name partners unearth what appears to be a stone Basilisk (a legendary reptile that was said to, much like the modern-day woman, turn people into stone with its glare). They bring the "statue" back to the U.S. and put it on display. Wouldn't you know it - an eclipse somehow melts the stone and the Basilisk comes to life and starts wreaking havoc. The military is called in to handle the situation, but Griffin and his buddies want to figure out a way to destroy the Basilisk before nuclear weapons become the only option. 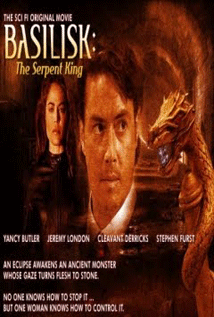 Thrown into the mix is Yancy Butler stealing an ancient scepter in an effort to control the Basilisk for her own unsavory plans. Nothing less than absolute stupidity ensues. Welp, that does it. I do believe I have finally run out of things to say about this kind of movie. You know it’s bad when a movie so lacks any hint of originality that there’s not much original to say about it in condescension. Who? Seriously, who gave the ol’ thumbs up to this project? There is someone responsible for this making it to the airwaves and I want to know who it is! What? What were they thinking? This is a movie that demands CGI, yet there’s no way it could ever have the budget to deliver acceptable special effects, so what’s even the point? There’s a scene early in the movie where the Basilisk turns a guy into stone. It looks like someone used the spray paint feature from a third-rate computer graphics program and sprayed an image of a guy with a little gray. Yep, it’s that bad. Where? Where can I submit my Movie Mark Originals? I want to meet the guy who reads the script for Basilisk: The Serpent King and says, “Yep, we’ve gotta put this to film.” I could churn out a screenplay a day if these are the low standards that I have to live up to! When? When exactly is the decision made to give a budget to this? I’m guessing sometime around minute 59 of Happy Hour. Why? I think this is the question we’re all most curious about. Why do movies like this keep getting made? Don’t get me wrong; I’m not complaining. Just like we all need human stupidity to make fun of, we also need stupid movies we can mock… something that allows us to put everything else into perspective. I just don’t know what good the people involved with the movie get out of it. Griffin from Party of Five gets to eat healthy for another week or two, I suppose. Near the movie’s unexciting “climax,” Yancy is delivering the typical “bad guy monologue,” giving the Basilisk just enough time to approach. She turns to run away, but the Basilisk chomps down on Ms. Butler’s derriere and rips her dress off. Griffin gets a stupid grin on his face and unemotionally says, “Heeeey!” Yancy, standing in her underwear (picture Tom Petty singing that), turns around and yells to the Basilisk, “That was original Versace you son of a ! @$%*!” She quickly realizes that yelling this to a huge, venomous mythological creature probably isn’t advisable, but it’s too late – the Basilisk eats her. Sorry if I spoiled anything for ya. But the scene that had me shaking my head with the most perplexity involved three geeks in the mall playing a Dungeons and Dragons type game. The Basilisk slithers past them and they excitedly argue whether it’s a dragon, a Basilisk, or some other term I’m not nerdy enough to recognize. They proceed with their game. Now obviously the only question left is whether this is worthy of the time of lovers of bad cinema. I’d say don’t try to sit down and watch it uninterrupted. If it’s on the Sy Fy Channel then invite your friends over, bust out the pizza and board games, and leave it on in the background for periodic ridicule. And if you’re ever in the mall while a Basilisk is running rampant, and someone asks you what to do then simply reply, “Have an Orange Julius and try to stay out of harm’s way.” I see no other option. As a general rule, any movie airing on the Sy Fy Channel containing any snake reference in the title will not be worth your time. As another general rule, any movie debuting on the Sy Fy Channel starring “the second Griffin from Party of Five” is starting off behind in the count. One last general rule – any movie simply debuting on the Sy Fy Channel is more than likely not worth your time. One character has the last name of “Baldwin.” Could this be a tribute to the straight-to-video king, Stevie B? The fact that Griffin’s character’s name is actually “Harrison” can’t be a coincidence. All doubt is removed when Yancy Butler makes a direct Indiana Jones reference. You may remember Yancy Butler as the Angelina Jolie look-alike who disappeared from the big screen after Hard Target and Drop Zone. Then again, you might not. In one scene Griffin recommends pumping Ashlee Simpson music through the mall speakers to drive the Basilisk crazy. It sounds funnier than it is. I would’ve recommended showing him this movie. Jeremy London is in Gods and Generals with Robert Duvall who is in Open Range with Kim Coates who is in XChange with Stephen Baldwin who is in The Young Riders with Josh Brolin who is in Hollow Man with Kevin Bacon. It debuted on the Sci-Fi Channel; there's really not much here to offend. Scratch that - there's a lot that will offend your intellect.